‘Singam 3’ is one of the most anticipated flicks of the recent times, even though the movie is still in its post production stage. The film is the third installment in the much celebrated ‘Singam‘ franchisee, and this is the main reason behind this pre release hype. As per latest updates, the movie’s shooting will start by November. Hari, the master in making Mass movies is directing this third part as well. The first two installments in Singam franchisee were huge hits, and they played a crucial role in affirming the mass image of the star. Anushka Shetty and Shruti Haasan are doing the roles of lady leads in this movie. Radha Ravi, Nasser and Yuvarani are also expected to play crucial roles in the movie. 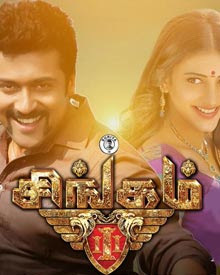 Suriya is now busy with the filming of ’24’ which is being directed by Vikram Kumar who made ‘Yaavarum Nalam’ in the past. The shooting of ‘Singam 3′ will begin after the completion of ’24’. More details regarding the technical crew of ‘Singam 3’ will be updated in the coming days.